Markets tumbled on Monday as embattled Facebook sparked a tech selloff — the most recent illustration of the mixed economic indicators prevalent in the news. Many of the economic indicators like consumer confidence and unemployment remain at an unprecedented level. The Federal Reserve reported that manufacturing production rebounded in February, up 1.2 percent, and consumer confidence soared to its highest level since 2004. At the same time, the U.S. Commerce Department reported retail spending declined 0.1 percent in February for the third straight month, according to Bloomberg Businessweek, surprising economists polled by Reuters, who had forecast retail sales rising 0.3 percent in February. Default rates on subprime auto loans climbed even as companies continue to finance those loans, Bloomberg reported. The Dow Jones Industrial Average ended down 335.60 points on Monday, or 1.35 percent, to 24610.91, while the S&P 500 lost 39.09 points, or 1.42 percent, to 2712.92. The Nasdaq fell 137.74 points, or 1.84 percent, to 7344.24. Several stock market writers today, such as Mark Hulbert in USA Today, cautioned against thinking the bull market is invincible. A CNBC headline on Monday said: “This index shows enthusiasm for the economy is getting out of hand,” while Goldman Sachs Group said stock market decline in February was a symptom of growing “financial fragility,” according to Bloomberg Markets. U.S. auto sales fell 2 percent in February, the Associated Press reported. Motor vehicle and parts sales fell 0.9 percent in February, decreasing for the fourth consecutive month and one of the larger drags in the latest economic report, according to the National Association of Manufacturers. The Federal Reserve reported that manufacturing production rebounded in February, up 1.2 percent, after edging down 0.2 percent in January. 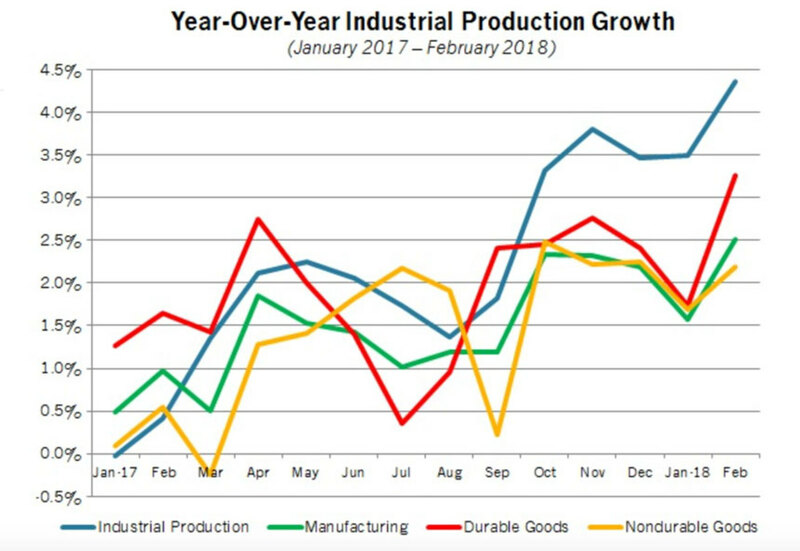 That was the fastest monthly pace of growth since October, and overall, the data continue to show healthy growth for manufacturers, with strength last year carrying over into this year, the NAM reported. The consumer price index has risen 2.3 percent over the past 12 months, the fastest year-over-year pace since March 2017, Moutray wrote, and producer prices for final demand goods and services have increased 2.9 percent year-over-year.